Here at TrapsDirect.com we have a committed focus on customer service and satisfaction. We dedicate many hours each day to helping customers understand how best to use our products and how to select which products will best fit their needs. Occasionally we will hear from a customer that doesn’t have a question but who instead has had a fantastic experience with one of our products. Of course, we greatly enjoy hearing success stories such as this and we will share one with you now. The subject line of the customer email is the title of this post, presented with one clarifying edit which is clearly indicated. To be clear, the above is a DIRECT QUOTE from the customer email. In fact, it is the entire email, presented with no editing or modification of any type. We pride ourselves here at TrapsDirect.com on making available only the very best solutions to problems with moths that infest common food products such as: flour, pasta, cereals, cocoa, tea, corn starch, confectioners’ sugar, soda crackers, bread crumbs, and others. These types of moths are also very commonly found in bird seed mixes, bulk peanuts, dog food, and other feeds for both domestic and wild animals. To be clear, however, despite Lois’s reference to a “closet” these traps are NOT effective against clothing or wool-eating moths. Our moth traps are not only always highly effective but also absolutely safe for adults, children, pets, and wildlife because they have zero pesticides. To best protect unintended animals, never place traps outdoors unless in a confined and protected space, such as a closed food receptacle like a lidded trash container or other such device, that cannot be accidentally accessed by pets or other animals. You would never want to place dangerous chemicals in your food pantry or near the food you use to feed pets or other animals and with these moth traps you don’t have to. Now, beginning just in June 2015, TrapsDirect.com is very pleased to announce that we offer not just one, but two options for food moth control and elimination. 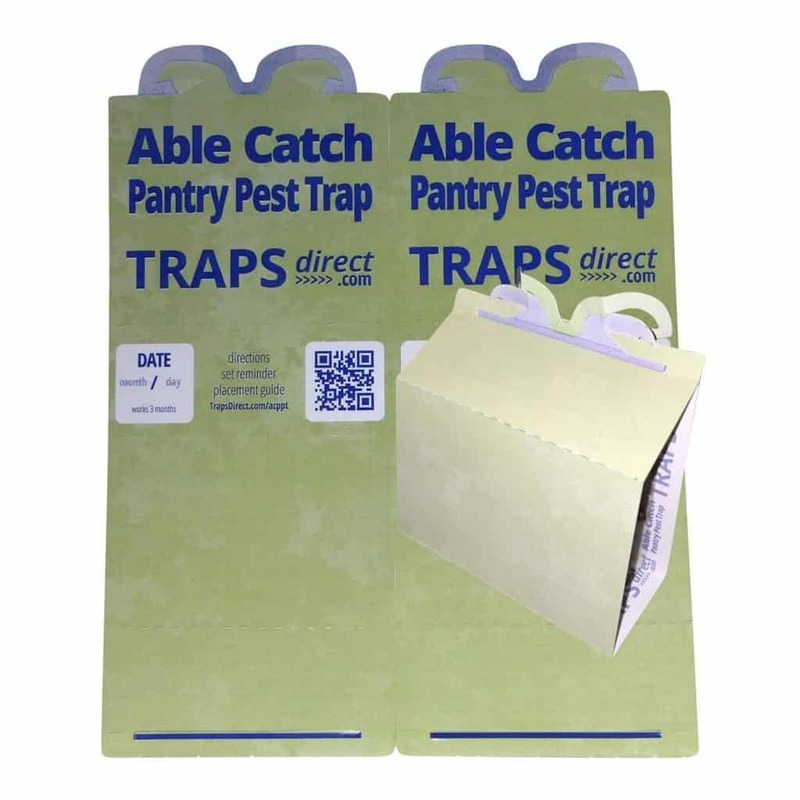 The new, and absolutely exclusive to TrapsDirect.com, Able Catch Pantry Pest Trap (ACPPT) is now available. It presents many unique advantages and benefits that the other existing traps just can’t provide and you can learn more about them here. If you are suffering a food moth infestation and just don’t know where to turn to get rid of the little buggers, then visit TrapsDirect.com today for your choice of the most effective solutions on the market at this time. Don’t just take our word for it though, remember what Lois had to say above and know that you will experience the “ultimate” results! This entry was posted in Ask Traps Direct, Moth Trap Blog, Moth Trap Reviews and tagged Able Catch Pantry Pest Trap, ACPPT, active trap field, Catchmaster Moth Traps, Fresh Pheromone Lures, how to get rid of moths, moth control, moth extermination, moth infestation, moth pheromone trap, moth traps, pantry moths.